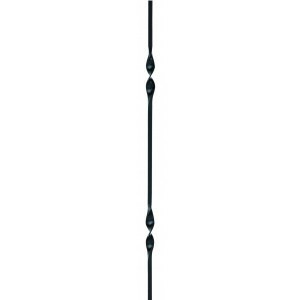 Metal spindles with a black coating and a delicate twist design that makes them suitable for almost any style home. These spindles can be cut to size and will suit landing or stair handrails. The Trademark range of stair parts with modern Metal Spindles by Richard Burbidge is one of the most popular ranges of stair parts we supply. These stair parts offer a unique way to transform a staircase, whether it's newly built or just needs to be refreshed. The combination of stunning natural timbers and black metal baluster provides classic design elements with a modern twist, allowing you to create something really special. The spindles in this collection are made from 12.7mm (1/2") square mild steel box section and double protected with a hard wearing and durable black hammered finish over a zinc phosphate coating. These modern metal spindles are available in a variety of styles that have been specially designed to be mixed and matched if desired. The metal stair spindles can be cut to length if required and are held in place with matching brackets on handrails and baserails that are un-slotted.